There’s nothing an exhibitor likes more than prestige --- except money. When you combine prestige and money, you’ve got the showman’s equivalent of a royal flush --- that rarest of happy circumstances wherein you’ve succeeded in separating coin from customer and maintained patron good will at the same time. MGM sold That’s Entertainment in 1974 with a brilliant tagline --- Boy, Do We Need It Now! 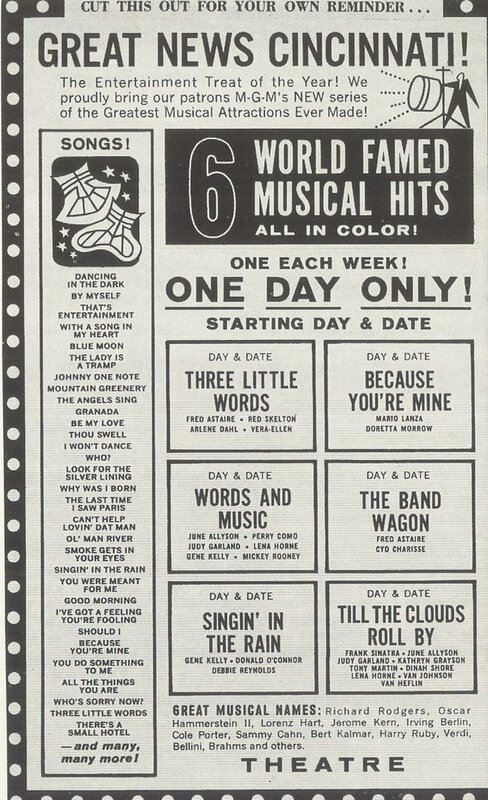 --- well, here’s a campaign they desperately needed back in 1962, and it was every bit the triumph of that later musical compilation. Unlike That’s Entertainment, however, it’s been forgotten, only because there’s no particular artifact to mark its place in exhibition history. 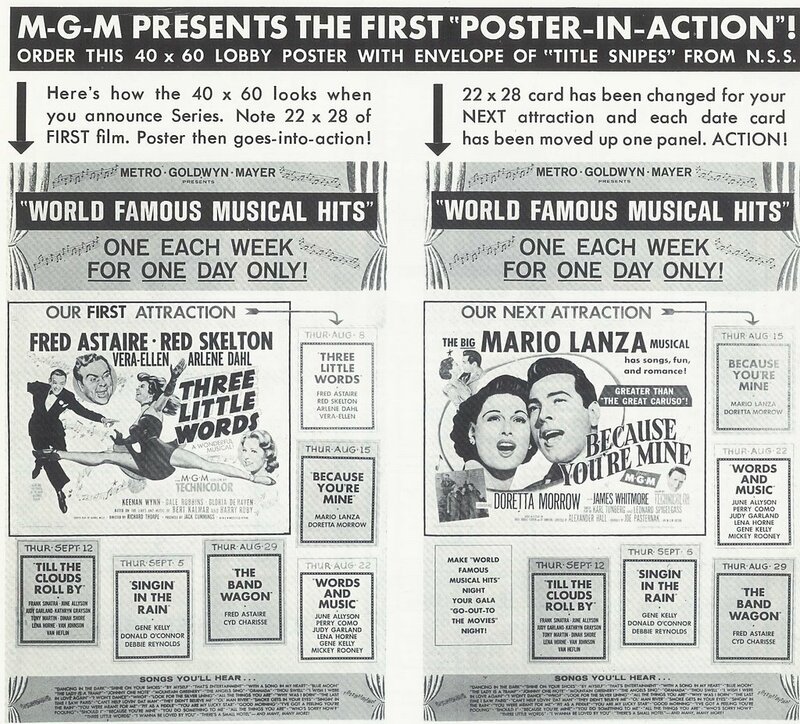 MGM’s Perpetual Product Plan never revolved around new releases --- it was all about re-issues --- and nobody got the mileage out of those like Metro in the sixties. My only regret is that I can’t congratulate the showmen responsible for this ingenious plan, but forty plus years is a long time, and chances are most of them are gone now. The scheme got its launch when MGM went into partnership with a network of independent exchanges throughout the country in early 1962. The idea was to exploit Metro's extensive library of old features, save distribution costs by splitting bounties with local franchisees, and throw the dice with limited engagements at flat rentals smaller houses and drive-ins could live with. The result was an immediate mop-up. 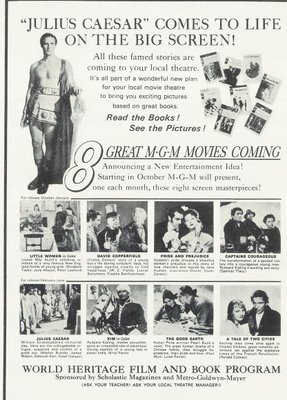 Veteran observers predicted a seven-year release cycle for hits like Ivanhoe and Knights Of The Round Table, a combo of which seemed to indicate Disney-like evergreen status for the two costume actioners. New trailers, fresh paper, streamlined pressbooks --- this could go on forever! 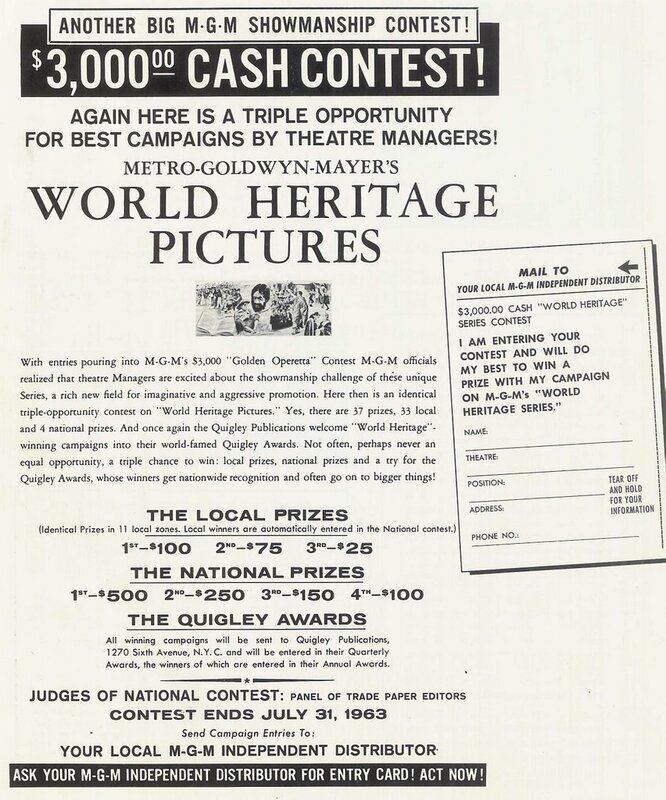 The real seismic shock came on May 8, 1962, when Danbury, Connecticut’s Stanley Theatre opened MGM’s series of Golden Operettas. Taking its bow before a packed house representing five to ten times normal level of patronage, the venerable songfests played one day a week (Wednesdays) for six weeks, and titles included Naughty Marietta, Rose Marie, The Great Waltz, and The Chocolate Soldier. Attendance is, and always has been, notoriously slow during mid-week, but these things shook the roof, and customers who’d shunned the house for years were now seeking out management (clad in black tie for the event) to thank him personally for bringing such clean and wholesome family entertainment back to the people. Heaven knows, the guy could use a pat on the back around this time, as disgruntled parents and civic minded busybodies continued to maintain that movie theatres were taking us all down a path toward perdition. Stanching the flow of such criticism was a bargain at thirty-five or forty dollars flat per booking. Metro ledger-keepers must have thought they were dreaming in the face of profits like these, and here’s the kicker --- much of it was for shows that had been playing free on television since 1956! The MacDonald/Eddy chestnuts and others like them were more than familiar to home viewers, yet here they were, paying an admission, and doing so in droves. Families That Go To The Movies Together --- Stay Together became Metro’s mantra. Little did they realize that these Operettas were only the locomotive that would drive a veritable money train. 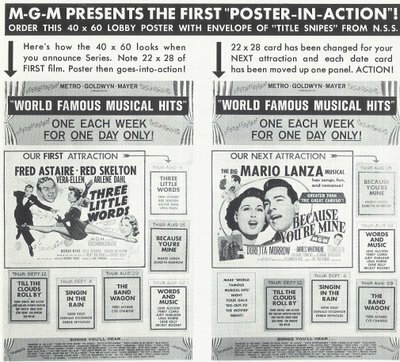 The campaign manuals said The Best Music Is The Cash Register, and MGM’s next trip to the well was its so-called World Heritage Pictures, two sets of six "movie masterpieces", again most of them pre-48 titles that had been wrung dry on TV, though you’d never know it from these crowds. This time, they went after the school kids. Public libraries and local opinion-makers were pressed into shilling service on behalf of Captains Courageous, The Good Earth, David Copperfield, and the like. Busloads of students rolled up for Julius Caesar, and since this was adjudged quality fare, the field trips were school sanctioned and took place during what would have otherwise been classroom hours. The resulting windfall to exhibitors both guaranteed pre-arranged full houses and a booming traffic in concessions, since kids often bored with twenty and thirty year old black and white movies were easily lured by the sweet aroma of fresh popcorn and sweets. What a culture shock for teens accustomed to the Troy Donahues and Sandra Dees to suddenly be confronted with Ronald Colman and Luise Rainer on their neighborhood theatre screen! There was even a National Advisory Committee Of Educators Of "World Heritage Film and Book Program." Now there’s a mouthful for someone’s resume. High school teachers, collegiate profs, even parish priests got in on the action. There was plenty of good citizenship to go around. Third and last of the series was the World Famous Musical Hits group, which may well have been the most popular of all, as it included show-stoppers along the lines of Singin’ In The Rain and The Bandwagon. 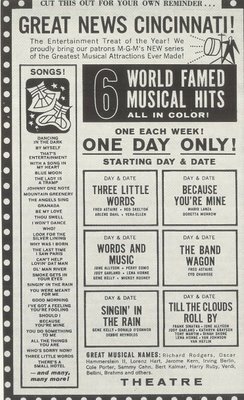 Radio deejays proved effective allies in spreading the word, and soundtrack album giveaways were the order of the day, as rock n’ roll inundated youth discovered vintage Fred Astaire and Judy Garland. Astaire’s dance studio namesake cashed in as well, and merchandising tie-ins offered near-limitless possibilities. 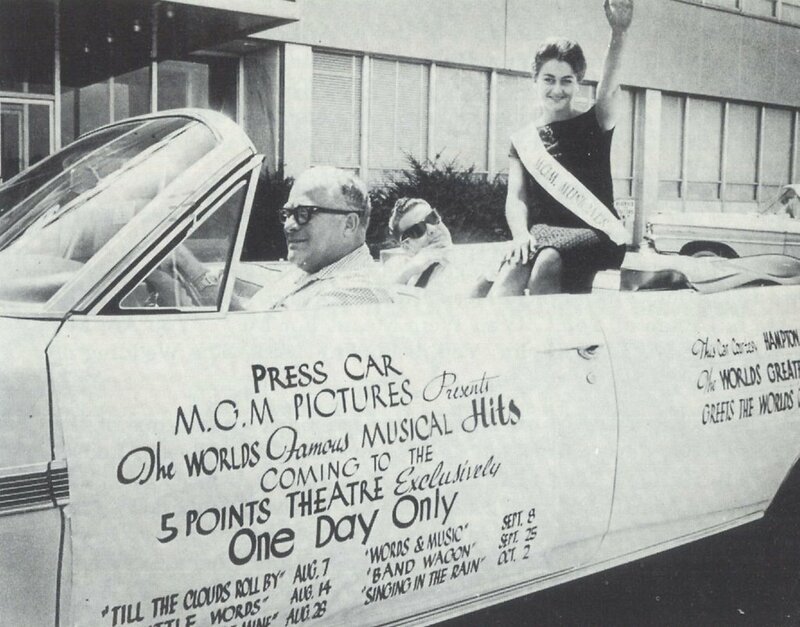 That Bonneville convertible bearing "Miss MGM Musicals Of Columbia, S.C." may as well have been on its way to the bank, judging by the look of satisfaction on the driver/exhibitor’s face. 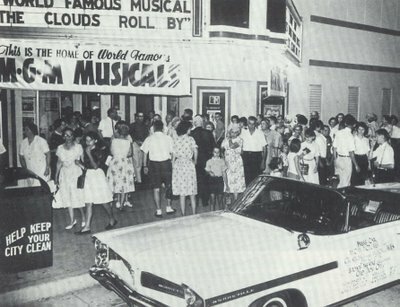 Here it is parked in front of Columbia’s Five Points Theatre for the gala opening of Till The Clouds Roll By, and bear in mind, this is 1963, not 1946! 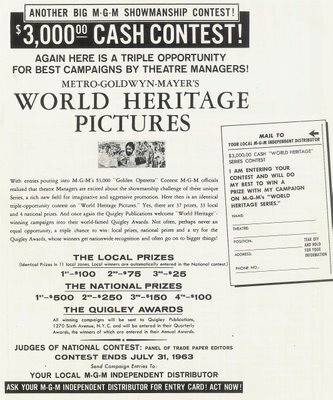 Read The Books --- See The Pictures was the magic phrase that forged the unholy alliance between schools and movie houses during that brief truce they enjoyed as the result of Metro’s World Heritage series, and on-the-ball exhibitors got further incentive with this cash contest for salesmanship brainstorms. 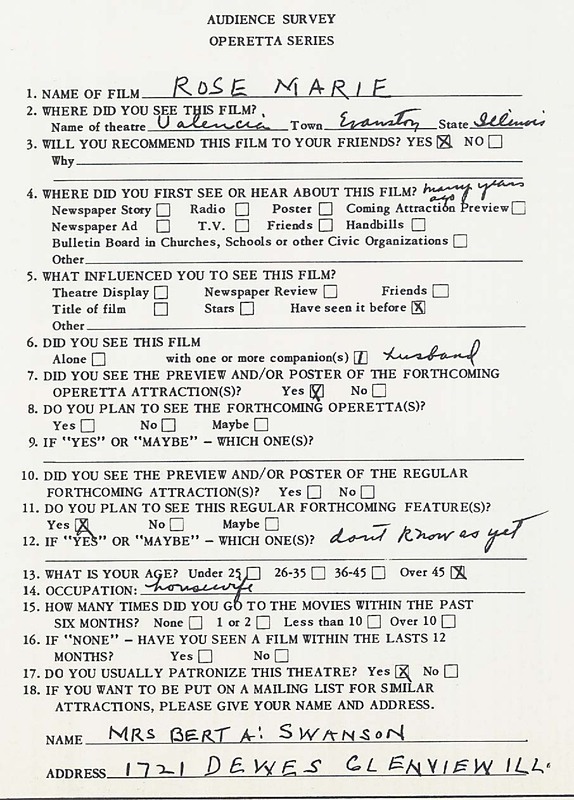 That audience survey was very much the real thing, and I wonder if Mrs. Bert A. Swanson, assuming she’s still with us, remembers her happy hours with Rose Marie back in 1962. 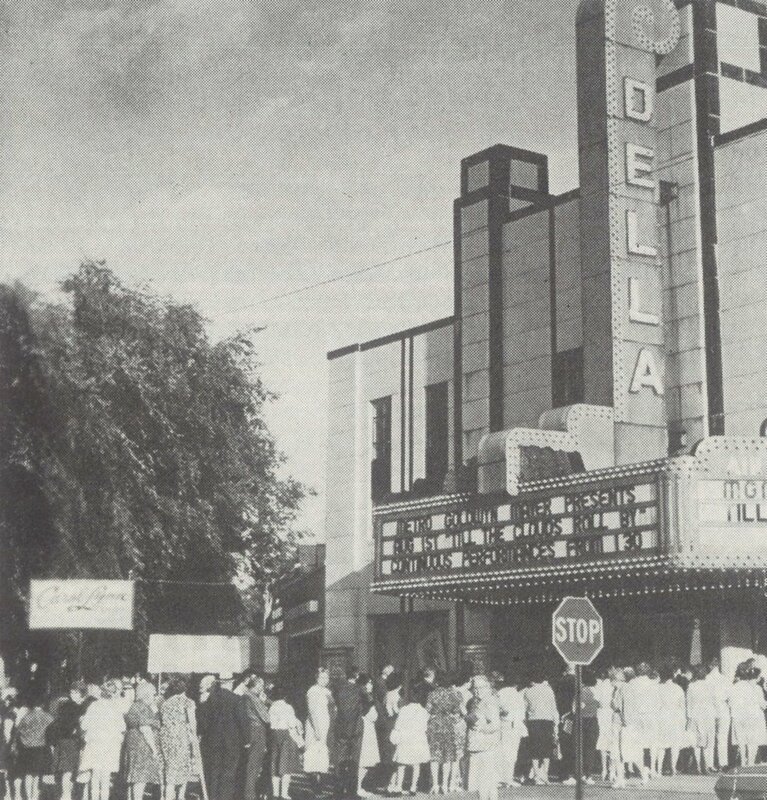 The Della Theatre in Flint, Michigan was boffo for Till The Clouds Roll By as well. Love their front, by the way. Wonder if those folks realized the movie had been playing the tube for seven years prior to their surrender of a ticket price? 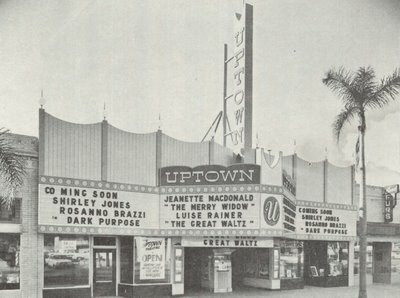 The Uptown in Pasadena, CA saw attendance jump when they paired The Merry Widow (1934!) with The Great Waltz in May 1964. Management was gratified by the respective conduct of moppets in the audience. Could it have been a hovering teacher presence in the auditorium that quelled youthful hijinks? 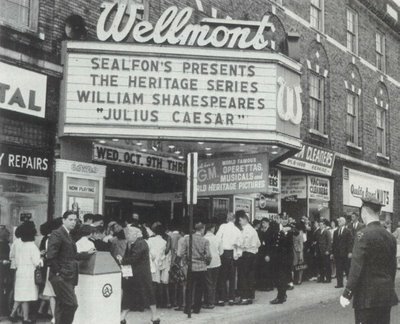 The Wellmont in Montclair, NJ had been servicing the "action" market when they switched policy and went over to Julius Caesar and the Heritage group. It’s just possible manager Harry A. Weiner got tired of chasing drunks and hop-heads out of their fifth viewing of Hercules and The Captive Women before cleaning their waste, bodily and otherwise, off the floors. How could these MGM classics be anything other than a step up for Harry? Once again, we thank Dr. Karl Thiede for sharing his knowledge and expertise in the area of distribution and exhibition, very much specialties of his. Couldn't do it without ya, Karl! I am from Columbia, SC and that theater in Five points is now home to a night club. By the way from that picture I don't believe that the car is parked in front of the theater. The building in the picture looks like a building downtown (just a little ways from Five Points), but I could be mistaken. Five Points now is the university's (U of S.Carolina) club, bar, and restaurant scene. 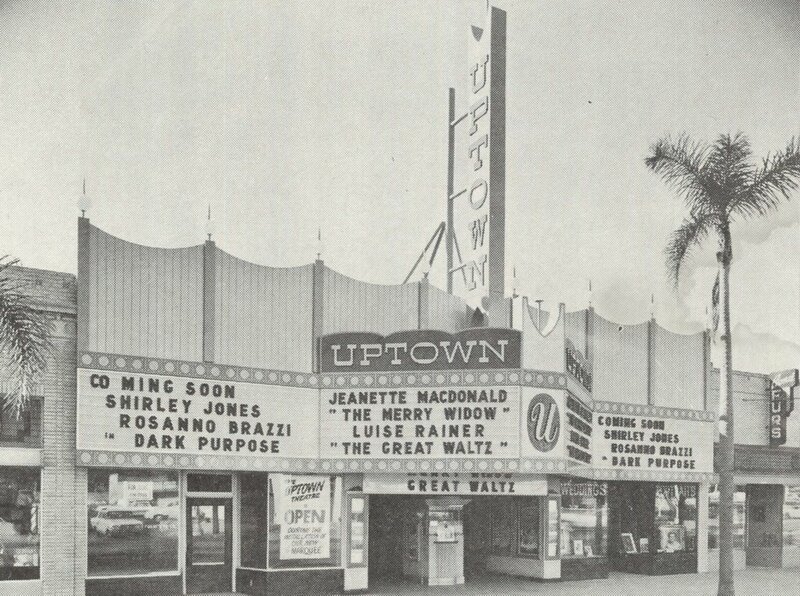 The theater you mentions still has the structure of the marquee up, but it is covered with a neon sign for the club. Sad. The last great marquee theater in Columbia, the Jefferson Square Theater folded up in the 90s. Fortunately when I was in High School I was able to see several classic films there when they were running some "anniversary" revivals in the late 80s- Gone With the Wind, Wizard of Oz, and Casablanca. Nothing compares to sitting in a "balconied" theater mesmerized by a classic on the largest screen I have ever laid eyes on. And I am glad to have had the experience even if some nights the only patrons were me and my friends. Boy do we need this NOW! Why don't they do it again? I haven't gone to a movie theater for years...and I miss the big screen experience. But price increase + movie quality decrease = me no go. Why, the theatrical showing could help PROMOTE the DVDs! Give new generations a chance to check out the movie for a lower price, and maybe they'll fall in love with it and buy the DVD later. Gee, they could even sell DVDs *in* the theaters. Oooh, I'm excited now. 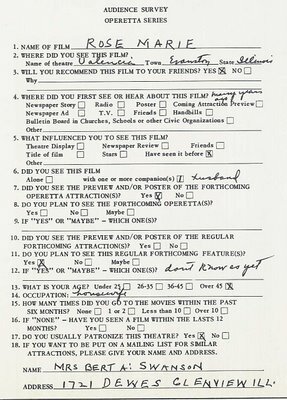 ;) After all, not many people can afford to blind-buy movies they're not familiar with. It sure seems like all the reasons for doing it back then, exist again today. The need for family friendly outings, etc. There's not much on TV that parents can safely let their kids watch. Turner Classic Movies, if they get that channel. Although that could change, with TCM running more contemporary adult-oriented films lately... plus upcoming additions of "classic" blaxploitation and skin flicks. Oh boy. Hey Christine, if I-who am on social assistance-can go to a movie twice each month, so can you! Just go tho the independent beyond first run theaters, which charge less money (look in the local papers for where they are. )Then you can enjoy a new movie at reduced prices-epic win on all fronts. As for you, Anonymous, may I suggest an investment in a home theater system complete with a Blu-Ray DVD player, and all of the specific movies in Blu-Ray? That works a lot.